Who doesn't love tennis? Like most boys who are “six-and-three-quarters,” my son Lucas Bacardi Shriftman is fixated with professional sports. He loves tennis - loves to play it, watch it on TV and go to matches; so it came as no surprise when he told me he wanted a tennis-themed party to celebrate his 7th birthday. 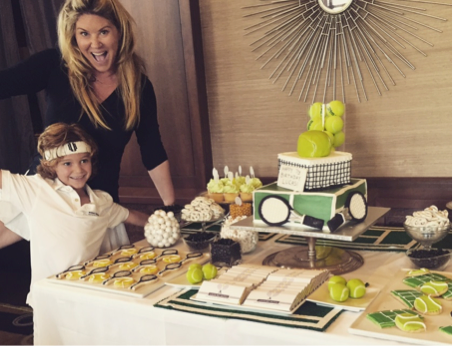 Of course he loves to plan parties, and loves to plan them early and “get creative.” Lucas and I have been to tons of tennis tournaments since the time he was born. My firm, Harrison & Shriftman also launched EleVen by Venus Williams, with three fun tennis themed parties, so of course that inspired this year’s tennis-themed party. Next, we set the date. Lucas’ birthday always falls during Spring Break which is a challenge because so many of his friends are away. But lucky for Lucas, it means he gets to celebrate on his actual birthday, and have a party or two, which he celebrated with his mom and his papa, Juan Bacardi, at one of his favorite restaurants. So, we always plan his birthday party after spring break is over, so all of his friends can come. We had the party at our tennis club. Lucas loves the Sunday brunch, so we decided to have the party on a Sunday and have brunch for the kids and adults in a private area where we could decorate in white and green, Preppie tennis party style. I worked with my favorite design duo, Anders Ruff to create a one-of-a-kind invitation to set the theme for the party. This year, Lucas and I agreed on the Preppie, simple and classic tennis invitations and labels. We designed an invitation card that invited Lucas’ friends to join us for tennis, lunch, swimming and cake and of course dress in your tennis whites. We also made printables chocolate bar wrappers, water bottle labels, and gift bag toppers and thank you notes at the same time. Lucas came up with the idea for “Lucas.Set.Match” for the wording. We love to mail hard invitations always followed by an email and we love to make custom stamps from Zazzle.com. This time it had Lucas’ photo on them. Lucas and I created the guest list together. I had guests respond to Lucas’ own e-mail address so that he could practice his reading and writing and correspondence. We used this list to create address labels for Thank You cards, as well. We wanted to keep it simple. We did one long table for the kids and adults. We made placemats out of AstroTurf we bought from Home Depot that we cut to placemat size and used white electrical tape to make them look like tennis courts. We then put the placemats with tennis balls around the table, ordered trophies from EDCO to use as centerpieces and tennis balls in glass bowls of different heights. We ordered paper, striped green and white straws for the drinks and created them with the number 7. Lucas even gave out the trophies to his friends after the party. For more fun, we bought small water bottles, took the labels off, wrapped them in custom labels that we printed on glossy paper on our home printer and sealed them with double-stick tape. We had the water bottles ready at the courts for the kids while they were playing. I love to create and design dessert tables because it always adds great décor to the theme. This time I started with a table and put the cake in the center (and higher up), as the focal point I took a round silver tray and flipped it over and then I put the cake on a silver cardboard cake tray in the center. I then built the dessert table around that. (I usually do a Happy Birthday banner in the front or some kind of poster behind it, but I didn’t do it this time). I like to do a balance where the cake is in the middle and both sides mirror each other. I did two white, square plates of cookies that were matching, on either side of the cake. I filled glass bowls of different sizes and heights with candy from Dylan’s Candy Bar in the party’s colors. I also used popcorn for the bowls because popped popcorn is a great way to fill small bowls and tie the table together. And of course, we decorated with real tennis balls. We couldn’t have had a party without The Cake Divas, so they shipped tennis-themed cookies and their signature cake pops to us from L.A. “The Cake Divas” have done desserts for Harrison & Shriftman for the past 15 years. Lucas and I scanned the computer for inspiration to come up with ideas and we mixed a few concepts together. This year we worked together to create a tennis cake surrounded by cupcakes, cake pops, and cookies shaped like tennis balls and tennis courts. Of course he wanted Nutella filling. They did cake pops without the sticks to look like tennis balls and put a big tennis ball on top of the cake. They made cookies in the shapes of tennis courts, rackets and balls. These treats were both beautiful and delicious. We even bought silver foil wrapped Hershey’s bars from JustChocolate.com and wrapped them in personalized candy bar wrappers from Anders Ruff to put in the center of the dessert bar. I like to be resourceful, so we also got cupcakes made at Publix and used vintage cake toppers we bought on Etsy to tie them into the theme. We had them do green icing to keep it within our color scheme. I also bought cookie cutters in the shape of tennis rackets and rectangles to make into tennis courts with the icing. Since all of the kids at the party didn’t know each other, we thought different tennis games on the court would be a great way for them to meet and play together. We had tennis instructors playing and directing different games for the kids that included Lucas’ favorite, 1 2 3, Jail, King of the Court, as well as matches. All of the courts had water and sunscreen on them to protect from the sun. After tennis, we had lunch and then cake and swimming at the pool where we hired a lifeguard. The kids played pool games such as Sharks & Minnows and had cake and desserts. We also bought healthy popcorn and did mini bags. We created in paper bag toppers and stapled them to have around. The gift bags had SoCozy, my new favorite kids’ shampoo, that comes from a line of premium, salon-quality kids hair products. They have shampoo, conditioner, detangler, gel, mousse and lice shampoo - and they all smell amazing. They are sold in Manhattan’s premiere children’s hair salon, Cozy’s Cuts, in New York City and just launched at TARGET. In the gift bags were also SQULZ, which are Velcro charms for wristbands that are available in countless colors and combinations and are fun to mix and match. You can put them on wristbands, headbands, hair accessories, ball chain necklaces, on the straps of your backpack and anywhere you can think of. You can wear it, strap it and wrap it and put them on your own accessories with the SQULZ Converter Coin. It is a fun activity and great for gift bags or personalized gifts. Giving back is really important and I’ve tried to teach it to Lucas at an early age. Every year, we donate half of the gifts to charity. Last year we donated to the Miami Children’s Hospital. This year when people asked Lucas what he wanted for his birthday he said $7, because he was turning 7, or books. Hand-written thank you notes are a must. Every year we create a thank you note at the same time we make the invite. It is a good way for Lucas to practice writing. We also return the labels at the same time. And it also helps with his coordination and gets him in the habit of writing thank you notes as a remembrance of a fun event attended by his friends to celebrate a wonderful birthday.